For years, Sonos has managed to hold on to the top spot in the wireless home audio space — a category it single-handedly created 16 years ago. During that time, there has been no shortage of competitors. From audio behemoths like Denon, Bose, and Yamaha and the surprising contributions from Amazon, Google, and Apple, many have imitated, but few have duplicated Sonos’ achievements. That may be about to change, though, and you can blame Canada. While few outside the audiophile world were paying attention, a small electronics distribution company based out of Ontario called Lenbrook International, has been acquiring some of the most respected brands in the business, namely NAD, and PSB Speakers. Using components from both of these groups, Lenbrook created Bluesound, a whole-home audio product aimed squarely at audio fans who like the Sonos model, but want audiophile-grade performance. To see if Bluesound has managed to upstage Sonos, we spent a week with the two systems, side-by-side, subjecting them to a full spate of usage scenarios: Listening to a private music collection, streaming from subscriptions services like Tidal and Google Music, running a multi-speaker home theater set-up, and multiroom operations. All the while, we took careful notes on how each system sounded, and how easy it was to use. Here’s what we found. This isn’t a complete list — both companies make other products — but these are the models that come closest to a direct comparison. The first thing that jumps out at you is the price difference. Bluesound components are — with the sole exception of the Pulse Sub — $150 to $200 more than a roughly equivalent Sonos product. To justify this, Bluesound has loaded its products with extra features not found on any Sonos unit. On the back of every Bluesound speaker, you’ll find an Ethernet port, USB port, headphone jack, and a combo optical/analog input jack. There’s also support for aptX Bluetooth alongside Wi-Fi, and the ability to play high-resolution audio files like lossless FLAC, MQA, WAV, and AIFF. This feature set is nearly identical to that of Denon’s HEOS line. But Bluesound’s product team will tell you there’s even more reason to feel good about the extra cash: The amplification is provided by NAD, and the speakers’ drivers are made by PSB, which is their way of saying you’re buying a product with the kind of decades-old audiophile street cred an upstart like Sonos can’t match. 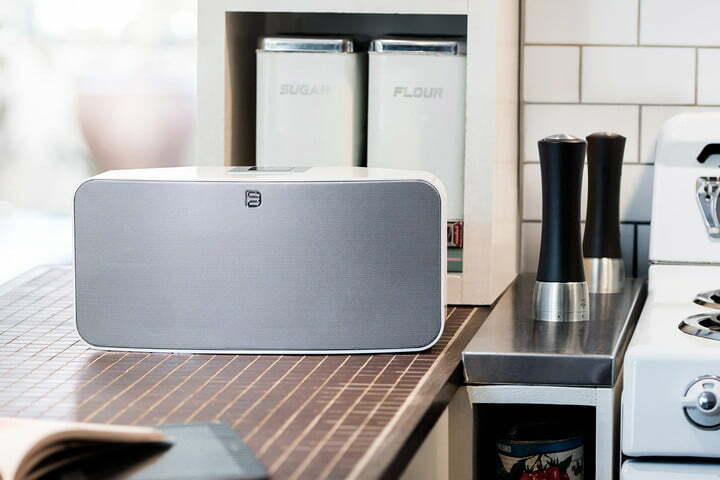 One Bluesound rep even went so far as to say, “Sonos is fine for background music.” Ouch. For our test, we matched up a pair of Play:1s, a Play:5, a Play:3, and a PlayBar, against a pair of Pulse Flexs, a Pulse 2, a Pulse Mini, and a Pulse Soundbar. Looking at Sonos’s product line leaves the impression that the company is still refining its design language. Some products have metal speaker grilles with fine perforations, and others — like the PlayBar — use a fabric covering. Some use physical buttons, while the newer products, like the Sonos One smart speaker and the Play:5 have touch and gesture sensitive controls. Most use matte-finished black or white plastic for the main body, except the SUB, which favors high-gloss finishes. Bluesound is more consistent with the look and feel of its products, though it also has some variation, especially with the controls: Depending on the product, you may get physical buttons (Pulse Flex), touch controls (Pulse Mini and Pulse 2), or, in the case of the Pulse Soundbar, no controls at all. Speaking of control, we were surprised to discover that all of the Bluesound products, except the Pulse Flex, can be controlled with an infrared remote. The company doesn’t include a remote in the box, because the speakers can be programmed to work with any IR remote, thanks to learning functionality. Play, pause, volume up & down, previous/next track, and presets can all be triggered. We suspect most people will only use this feature with the Pulse Soundbar, but it’s great to have the option. Sonos offers this on its PlayBar and PlayBase exclusively, and only for volume control. Both companies have integrated power supplies into their speakers, something which very few manufacturers do these days, and we love it. It can be hard enough to hide a power cord, but add a bulky AC adapter, or wall-wart, and things can get downright ugly. Sonos has done a better job of hiding the power inputs on its speakers, but we appreciate that Bluesound has designed its power cords with 90-degree angles on some models, to help minimize how much they protrude. It’s also worth noting that the Pulse Flex can be equipped with an optional battery pack for outdoor use. We also think Bluesound deserves credit for including integrated handles on the Pulse 2, Pulse Mini, and the Pulse Soundbar. Handles may seem unimportant in the big scheme, but given that Bluesound speakers have an array of direct-connection options, like Bluetooth and line-in, it just makes sense that you should be able to tote them around as easily as possible. Sonos speakers only work when connected to a home Wi-Fi network, so we understand why they felt handles to be superfluous. Each system is controlled via a companion app for iOS/Android for mobile device, and both offer apps for Windows/Mac. Sonos calls its app simply “Sonos” while Bluesound calls its app “BluOS.” Using the mobile app to set them up is equally easy, but with slightly different approaches. With Sonos, you need to physically press two buttons on a speaker to sync it to the system, whereas Bluesound asks you to flip to your phone’s Wi-Fi device list, and find the new speaker before finishing the setup back in the BluOS app. We prefer Sonos’s modestly simpler technique because switching out and in from an app always feels clunky, but both ways were equally quick. Smart home control, especially when done using your voice via Amazon’s Alexa, Google’s Assistant, or Apple’s Siri, is a massive trend right now. Sonos was one of the first audio companies to launch compatibility with Alexa, both through its new Sonos One smart speaker, or via any of Amazon’s Echo products. It intends to offer Google Assistant later this year. Bluesound tells us it plans to integrate voice control but is still looking at which technology will provide the best user experience. For now, advantage Sonos. One of the best parts of investing in a whole-home audio system is being able to control the music for every room in the house from the palm of your hand. From the get-go, Sonos has set the benchmark for making this an easy, intuitive experience, and we’ve seen a lot of competitors fail to live up to that high bar. Bluesound manages to exceed it. In both mobile and desktop versions of its app, grouping and ungrouping speakers is effortless, thanks to little plus-sign buttons next to each speaker in the speaker list. Tap the speaker you want to group, then tap the plus buttons next to each speaker you want to join it. That’s it. Removing speakers is a two-tap process, but killing the group itself only takes one tap. Engaging all of your speakers to play the same music is just as easy. Not that it’s hard to do this with Sonos products, but with Sonos, you do it through an intermediary dialog window. Bluesound has also added a unique feature to multi-speaker control: If at any time you want to switch the music you’re listening to from one speaker to another, there’s an arrow button you can tap, which brings up the list of speakers so you can pick where the music should go. You can do this on Sonos too, but only via the grouping function, which is a little less convenient. One thing we noticed with Bluesound gear is that it’s a lot fussier than Sonos when it comes to Wi-Fi. In order to maximize performance, and ensure that there are no problems with dropouts, the speakers need a really strong connection to your Wi-Fi (assuming you’re using wireless networking). Unlike Sonos products, which can run their own mesh network when one of them is connected to Ethernet, Bluesound components must each maintain their own connection to your router. We encountered a few glitches along the way, including a strange problem with some of the speakers associating themselves to a mesh Wi-Fi node that had a weaker signal than the one closest to them. Power cycling them fixed this, but we found Sonos to be a more stable system overall. 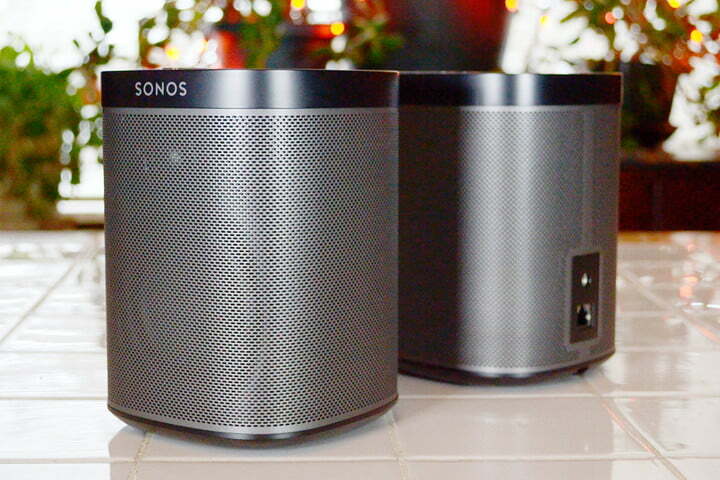 When it comes to streaming music services, no one beats Sonos for choice. With built-in support for over 60 subscription services including all of the majors, like Apple Music, Spotify, and Pandora, Sonos remains the streaming music king. Bluesound currently has support for 16 services — a far cry from Sonos — but includes Spotify, Amazon Music, Deezer, and Tidal. Company reps tell us they’re actively working on adding the missing biggies like Apple Music, and Google Play, but customers who buy Bluesound for its support of high resolution music may not mind the wait: It already supports Tidal, and Qobuz, which are the two main providers of lossless streaming music at the moment. You can, of course, stream any music service you have on your phone or tablet to a Bluesound speaker via Bluetooth, but this isn’t a true replacement for native support. For one thing, audio quality takes a hit compared to Wi-Fi, especially if your phone isn’t aptX compatible (all iPhones), and you’ll need to shuttle back and forth between the BluOS app and your music service’s app. Despite Bluesound’s plethora of inputs, none of these are able to act as sources for other Bluesound speakers. Connecting to a Pulse 2 via Bluetooth, for instance, means you can only listen on the Pulse 2 — speakers grouped with the Pulse 2 will sit idle as long as you’ve chosen Bluetooth as the source. Same goes for USB, and line-in. Bluesound’s team is aware that this puts them behind folks like Denon, and Yamaha, which can both distribute inputs from one speaker to many, and says they’re going to make this happen in a future update. If and when they do, it will be a convenient way to invite guests to play music from their devices, something which Sonos is still unable to provide. Got lots of music on your computer, some more on your phone, and millions of more tracks available via streaming services? That’s a lot to wade through especially when you’re looking for a very specific song or album. The solution is a comprehensive search feature, and ever since Sonos introduced its universal search, it’s been the one to beat. With one field to search across genres, types, and mediums, no one does search as well as Sonos, but Bluesound comes closer than most. While there’s no universal search, there is a very good — and fast — search function for each music source, be it your music library, or a streaming service. Unfortunately you can’t filter a search. Instead, search results are organized by type, so a search for “Dire Straits,” will return a list that begins with artists, moves to albums, then finishes with songs (if any). Depending on the search term, that could be a lot of scrolling. So which one sounds better? This is always the hardest part of any review. It’s harder still when you introduce elements like high-resolution audio, or get into the weeds on attributes like EQ: Which is better, a flat, unadulterated EQ that stays true to the source, or one that has been massaged by digital signal processing (DSP)? For our comparison, we set up each speaker according to the step-by-step guidance the apps gave us. If the app encouraged us to do special tuning, as Sonos’ Trueplay system does, we did it. If not, we left things alone, working with the system’s default settings. Both Sonos and Bluesound give users the ability to modify bass and treble, but neither gives you a full-featured equalizer. For the majority of our test, we ran identical Tidal tracks through each system. When the highest available quality for a given track was 16-bit FLAC (CD quality) we’d play that version on both. When a high-res, or MQA version was available, we’d play that through the Bluesound system too, to see if we could detect the improvements of high resolution. We also listened to radio stations via TuneIn, local MP3, AAC, and FLAC files ripped from CD, or downloaded from iTunes, and used a variety of source devices, e.g. an iPhone 6, a Pixel XL, and a NAS drive. Finally, because both systems are designed to work as home theatre speakers when the sound bars are paired with two rear channel speakers, we used them with 2-channel, 5.1 Dolby, and Dolby Atmos sources via an optical cable from an LG OLED TV. Even though the Bluesound speakers delivered better definition (especially with high-res tracks), achieved significantly higher volume levels than their Sonos equivalents, and could reproduce high frequency sounds like Adele’s soaring vocals with ear-piercing precision, we think most people will still prefer Sonos. How can that be? We think the answer lies in the different approach each company takes to sound reproduction. With its roots in audiophile-grade equipment, and under the heavy influence of PSB’s Paul Barton — who may hold the unofficial record for most hours spent in an anechoic chamber – Bluesound believes in a flat frequency response curve. In other words, its DSP (digital signal processing) shouldn’t play any role in modifying the EQ of the source material. Sonos takes a decidedly different approach, using its DSP to tweak the frequencies, and going a step further with its Trueplay tuning to ensure that this tweaking is a reflection of the listening environment. Bluesound’s approach creates sound that, while powerful, clean, and precise, lacks warmth, fullness, and range. Sonos, by contrast, doesn’t deliver the same precision, and can’t get as loud, but its EQ acrobatics let you experience more of the low and midrange — that “warmth” we’re referring to — while simultaneously shaping the way the music fills the room. We auditioned the systems for friends and family, without telling them any of this, and simply asked which system sounded better. Without exception, they preferred Sonos. That’s not at all scientific, and it’s quite possible that if we had brought in a dedicated group of audiophiles to listen, they would have said the opposite. The takeaway here is that, while a flat frequency response may indeed be the most authentic way to reproduce a song, many ears may prefer something else. Before testing the two systems, we thought Bluesound’s touted high-resolution playback would be the obvious point in its favor, but that didn’t materialize as much as we expected. Yes, we certainly heard a difference, but it was subtle. Not only was there virtually no improvement on the small Pulse Flex, we had to really crank up the volume on the Pulse 2 and Pulse Soundbar to hear the extra detail. It was there, no doubt about it, but, to put a number on it, we’d say it only improved things by about 10 percent. On the home theater front, the difference between the two systems becomes acute. Bluesound can decode Dolby 5.1, but it can’t use it to create a surround sound experience through just the Pulse Soundbar. The PlayBar, on the other hand, is dazzling, with an uncanny ability to trick your ears into thinking there’s not only a set of surrounds, but a subwoofer too. If Bluesound has an edge here, it’s with dialogue. The high-end precision of its tweeters, combined with its lack of sound shaping, means all voices are that much easier to hear. Sonos continues to be the best choice for most people thanks to its combination of price, performance, ease of use, and compatibility with nearly every music source on the planet. Tack on its leadership position in the smart home space, and you get a nearly perfect whole-home audio experience. 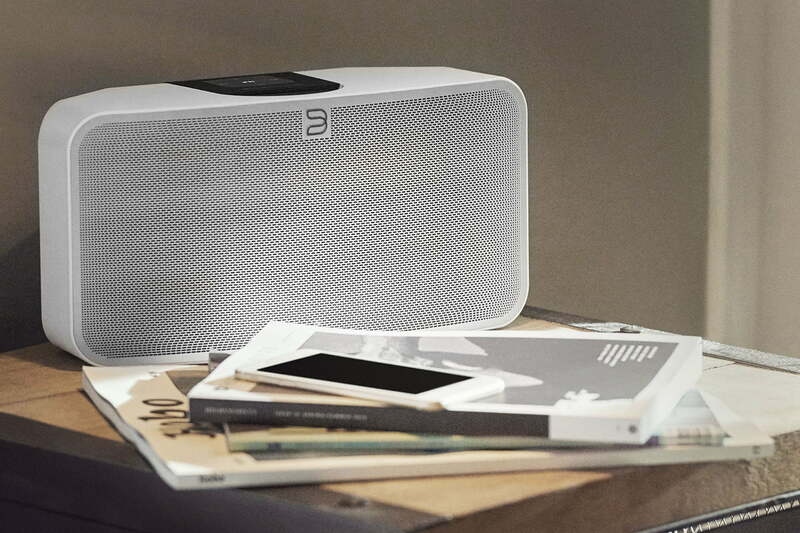 But there’s always room for competition, and Bluesound has proven itself a strong contender. 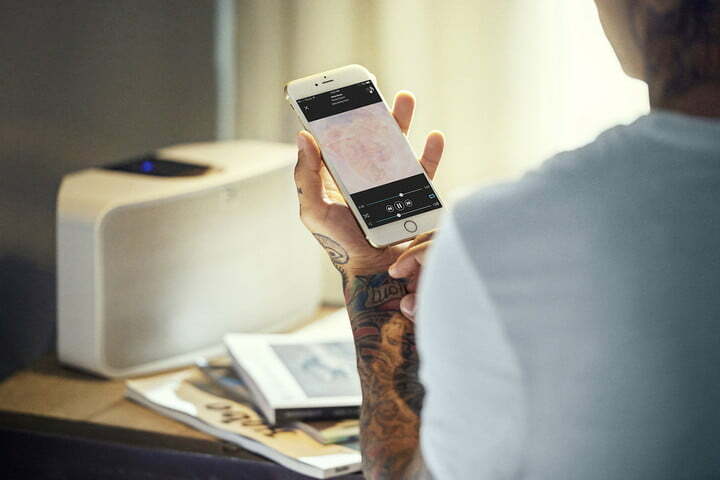 With an unparalleled number of inputs, IR remote compatibility, high-resolution playback, and superb accuracy, Bluesound speakers deftly fill in gaps in the Sonos story. As much as we agree that Bluesound can justify some of its price premium based on these features, ultimately they need to sound better to seal the deal. We think most people will prefer how Sonos sounds, and so for now, the company that started the wireless hi-fi category, remains the king.